International Temperance Day sponsored by RAHAMA Sri Lanka. RAHAMA gives higher priority in it’s profile of services to strengthen social groups, civic centre leaders and the institutes committed to resolve the menace of the usage or carrying alcohol and drugs. This effort is also vital since allocating time and money on alcohol, cigarettes or drugs by the resettling families can usher negative impact on the output of livelihoods being implemented by RAHAMA and other institutions. 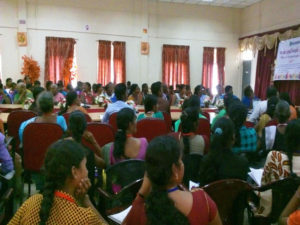 The recent Temperance day celebration was held in November 2017 with self-motivated participation of 220 persons from 13Partner organizations. FOYO, VOGT, CRDC, MWDCS, CAT were the leading civil organizations in the region who shared the results of anti alcohol and harmful drugs. campaigns launched in 2016 and 2017. Views were also shared on actions being implemented on anti drugs and alcohol in global level, while also sharing viewpoints on the best mechanisms to be devolved in this task for better results.